Description - Our Runway carpet tiles are a commercial grade carpet tile specifically designed to be installed in areas of very high traffic. This modular carpet tile comes in 6 neutral colors that are sure to coordinate with any color scheme in your commercial setting. Runway is a ‘berber’ style carpet tile and features a vinyl backing that is composed of recycled PVC. 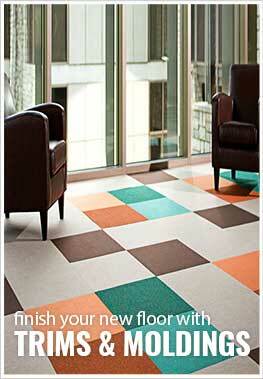 This backing helps to give the floor tile added flexibility and durability. This tile is also recommended to be installed in a Quarter Turn (Parquet) pattern to ensure the viability of the tile and should be installed with a pressure sensitive adhesive in commercial environments. These floor tiles can be easily removed and installed if damaged beyond repair, meaning less time and money lost repairing your floor. Our commercial carpet tiles are also backed by a lifetime warranty and are built to last for as long as you own your floor. Recommended Installation Pattern - ¼ Turn (Parquet). Material - 100% Solution Dyed Nylon composed of up to 19% recycled material with a Nexus backing. Nexus backing is a recycled PVC backing. Traffic Type - High - (Tiles are more coarse than medium; Not recommended for bedrooms or playrooms; for use in high traffic areas like entry ways, garages, Commercial flooring). Recommended Uses - Our Runway Carpet Tiles have been used in many commercial and residential applications because of their durability and ease of maintenance. Because of these facts, carpet tiles are being used more and more in residential homes. These carpet tile squares have been used in entry ways, commercial kitchens, weight rooms, garages, workout rooms, and many other areas. These tiles can be very coarse, so we would not recommend them for a bedroom or playroom where a softer carpet tile is needed. In wall to wall installations, tiles can be adhered with Tile Tabs or you can use a pressure sensitive adhesive for a more permanent hold. You would apply the adhesive with 1/16" x 1/32" x 1/32" U notch trowel. If you are using the tiles to create a rug, then the Tile Tabs or double-sided carpet tape is all that is required to keep the tiles in place. For commercial or permanent installations, the use of a pressure sensitive adhesive or acrylic adhesive would be recommended to keep the tiles in place. Again, you would use a 1/16" x 1/32" x 1/32" U notch trowel to apply the adhesive. Resistant to staining and soiling.